The United States Congress designated the Sycamore Canyon Wilderness (map) in 1972 and it now has a total of 58,441 acres. All of this wilderness is located in Arizona and is managed by the Forest Service. The Sycamore Canyon Wilderness is bordered by the Red Rock-Secret Mountain Wilderness to the east. This sprawling Arizona Wilderness encompasses all of Sycamore Canyon, from its pine- and fir-forested rim on the Colorado Plateau down through the Mogollon Rim to its desert mouth in the Verde Valley. The canyon winds for over 20 miles along Sycamore Creek, at places stretching seven miles from rim to rim. Carved walls reveal layers of lovely red sandstone, spectacular white limestone, and rugged brown lava. Pinnacles tower above the high, colorful cliffs, and the water of the creek allows a rich habitat to flourish, including sycamores, walnuts, and cottonwoods. It is one of Arizona's most dramatic and beautiful canyons. Many ring-tailed cats, wide-eyed cousins of the raccoon, live here, along with black bears, mountain lions, seasonal elk and deer, rattlesnakes, scorpions, and many smaller animals. Canyon wrens and hermit thrushes send their delightful songs along the trail with you. Although you can choose from several trails, year-round water is limited to the lower reaches of the canyon. 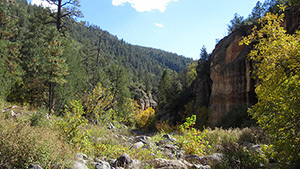 Take the 11-mile-long Sycamore Rim Trail Loop for a great look into the canyon. Backpackers should always carry ample water when venturing up the canyon. It's best to avoid the screaming-hot summers. A small portion of the southern end, from a half mile above Parson's Spring, has been closed to overnight camping. The Wilderness lies within three national forests: Coconino, Kaibab, and Prescott. Planning to Visit the Sycamore Canyon Wilderness? How to follow the seven standard Leave No Trace principles differs in different parts of the country (desert vs. Rocky Mountains). Click on any of the principles listed below to learn more about how they apply in the Sycamore Canyon Wilderness.